Do you have your desk calendar for 2012 yet? I usually get one in my stocking every year, but this year I am happy to say that I did not. I say this not because I do not want a calendar, I actually love having a physical calendar to look at. I am happy that I have space on my desk to make Scout Creative’s Calendar of the Month! I discovered Scout Creative’s Calendar of the Month Club last November and I was pretty disappointed that I had missed the whole year of awesome 3D paper calendars! I’m really looking forward to starting 2012 with a super creative desk calendar by my side! To get your own, you can like Scout Creative on Facebook, or sign up to get each month’s new calendar emailed to you. This month, the calendar is a Yakuza Ramen Noodle shop complete with a tattooed terror! You can even purchase the template for three more gangsters in Scout Creative’s Etsy shop for only $1.49! In addition to this awesome monthly surprise, they have revamped last years 3D calendar for 2012. You can get the PDF to create a whole year of calendars all at once in their Etsy shop! They are all so cute, that I honestly can’t choose a favorite! All I know is that I can’t wait to see what they come up with next! A few years ago, I thought that it would be fun to make a little wreath to help decorate my home for Christmas. I expected it to be somewhat difficult and time-consuming, but the opposite was true! It turns out that making your own christmas wreaths (if you start with a base) is really, really easy…and you get some gorgeous results! The wreath that is pictured above is my own creation. I just purchased a grape-vine wreath and some artificial flowers and berries from the craft store and threw it all together in less than an hour! I just used hot glue and crafting wire to hold everything together, and made a little hook out of crafting wire for the back. It was super simple, and has been a part of my holiday decorations for years! It got me to thinking though, what other awesomely easy Christmas wreaths are out there to make? I did a little searching and this is what I came up with. One of my favorite looks for wreaths has been the cluster of christmas ornaments. They are just so bright, shiny, and festive that you can’t help but stop to admire them! Turns out, they are not too hard to make either! I found a great tutorial on Matt and Becky’s Blog. You can see their results below, and I have to say they did a beautiful job! Recently, I have been seeing a lot of felt flowers around. I love how soft and cute they are! Jen, from Tater Tots and Jello has shared her sister’s awesome tutorial for how to make a gorgeous wreath and even provides a link showing how to make one of her favorite felt flowers. It all came together quite nicely, and looks fantastic! Recently, I have been intrigued by all of the awesome things that you can do with paper…particularly recycled paper. I have seen many, many fun crafts that can be done using old toilet paper tubes. Of course, making a wreath out of them is on the list! See you there design provides a great tutorial for making a really cute wreath out of recycled toilet paper and paper towel tubes. Just don’t forget the most important tool of all…that glass of your favorite wine! Finally, it wouldn’t be right to have a post about Christmas wreaths without a tutorial on how to make the classic fresh fir wreath. Let’s be honest…nothing beats the real thing! 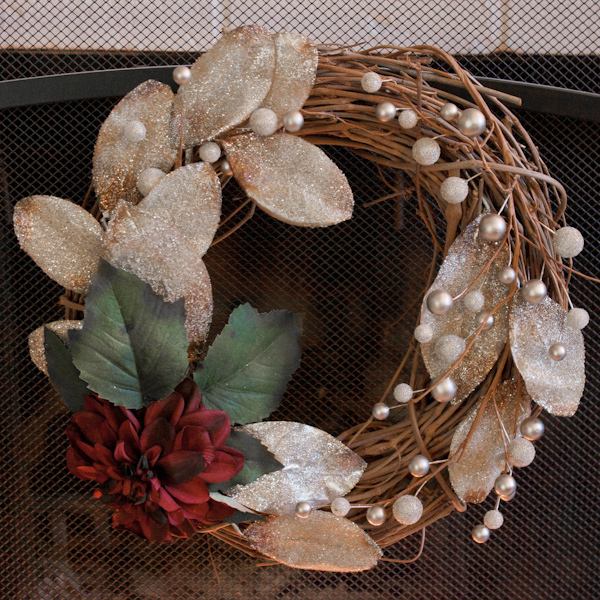 Save-on-Crafts has a great post with directions for how to make your own fresh greenery wreath. There is also some discussion about different wreath forms and many more ideas for making some awesome wreaths! My obsession with paper tends to get a little out of control around the holidays. There are so many lovely, cute, and just plain awesome gift wrapping options available that I find it hard to hold back on not buying them all! Last year, I promised myself that I would not buy any new wrapping paper until I used what I had. It was tough. Really, really tough. But I did it, and we all know what that means! I am free to buy loads of new paper this year! I have several rolls already, and I am going to be honest, there will probably be more! Gift giving tends to get a little out of control right along with the paper buying. I usually set a budget for myself, and blow it out of the water in a matter of days! This means, however, that I will have even more beautiful presents to adorn the space beneath my tree. In my opinion, the wrapping is nearly as important as the gift itself! 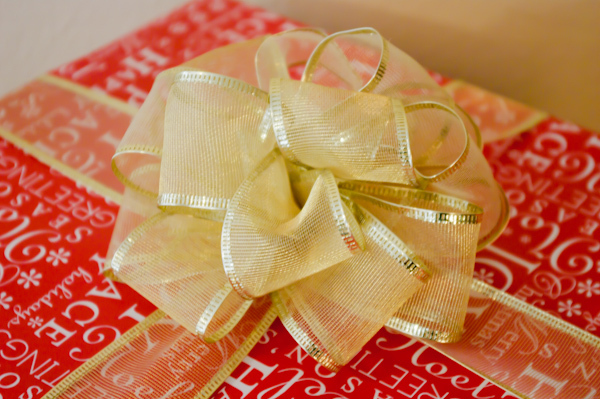 I have spent years perfecting my wrapping skills, but there is one thing that I feel really makes the gift wrapping shine….and that is the bow! I will admit that I have been guilty of buying the giant bag o’ bows from the seasonal section of the grocery store. They are just too affordable to ignore, but instead of slapping a mass produced bow on every gift, i like to mix it up with a few of my own hand made varieties. 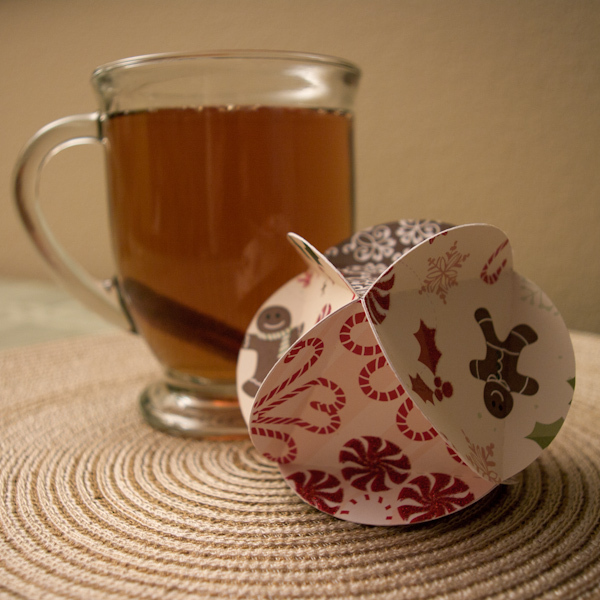 This year, I made a design for a cute little paper bow. They are designed so that I can either put some tape on the back and stick them to the gift directly, or I can run a ribbon through the back for an even more classic look! 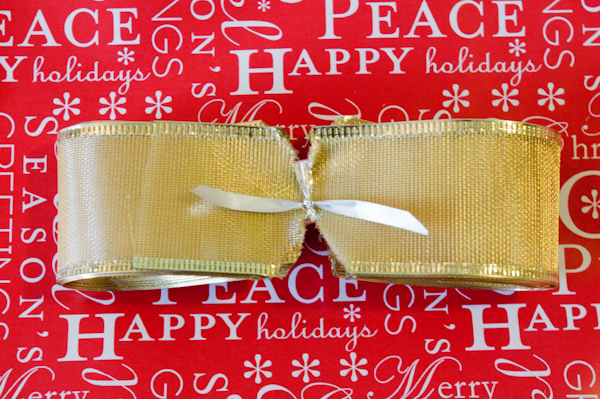 These bows are great for smaller presents, but for the large gifts, nothing beats a big, beautiful, fabric gift bow! I like to use ribbon with wire edges, as they are easier to shape once they are assembled. The length and width of ribbon that I use depends on the size of the bow, and the number of loops. 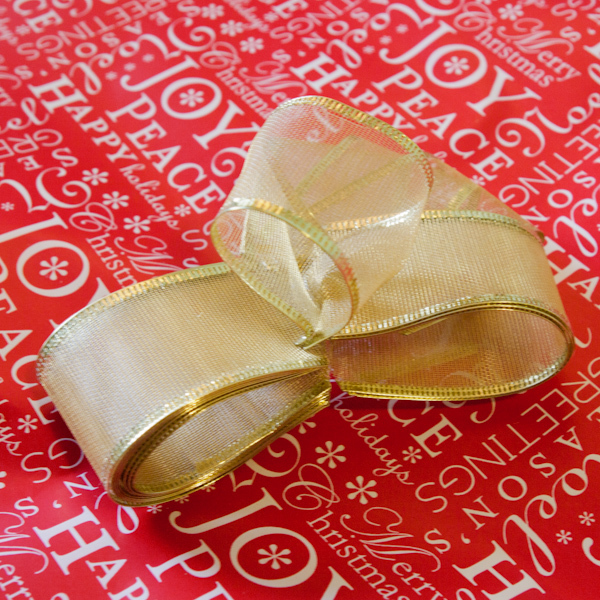 In the example below, I used about 6′ of 1.5″ wide ribbon for the bow itself, and looped it 8 times. You can do whatever looks right to you! Start with the end of the ribbon under your thumb. Wrap the ribbon around your hand 6 to 10 times. The more loops you do, the fuller your bow will be. Also, the size of the loop will be the approximate diameter of your bow. Cut the other end of the ribbon, making sure that the ends overlap at the bottom of your loops. Hold together the center of the bow, and cut notches out of each side. Be careful not to cut yourself when using wire ribbon…it can be hard to cut through. 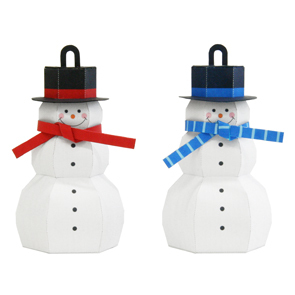 Using a small piece of string or curling ribbon, tie together the layers of looped ribbon at the notches. Turn over your bow. While holding onto the string at the bottom of the bow, fan out the loops. Spread each loop away from the others and twist. Do this for all of the loops and form your bow until it looks right. Using a piece of double sided tape or a glue dot (I like to use Zots 3D), adhere your bow to the package. Make any final adjustments before placing the gift under the tree. So Festive! At home, we have a very wide range of christmas ornaments that range from delicate, intricately painted glass to candy cane reindeer that I made when I was 5. The tree is always such a hodgepodge! When I moved out on my own and had to purchase my own christmas ornaments, I decided that my tree would be very chic with a silver and blue color scheme. I have to admit, it looked fantastic! Over the years, however, I have come to miss the hodgepodge. I have been adding little ornaments here and there to try to mix it up a bit. Recently, I have seen a bunch of paper globe ornaments around. 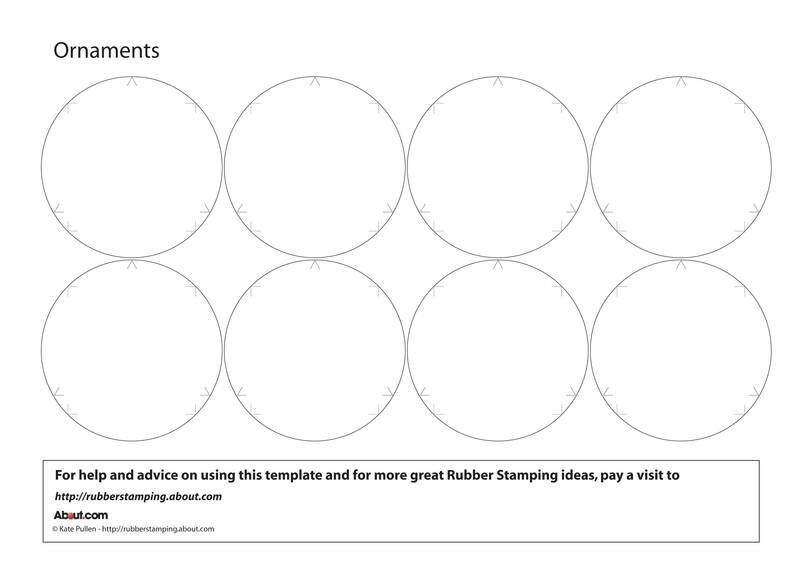 Looking around, I have found several templates, including the one shown below which I found at rubberstamping.about.com. Using my Silhouette SD, manually digitized the above template and made my own little ornament! I used the perforated line to “score” the folds, and it worked great! While searching for a template for the globe ornaments, I also came across Canon’s Creative Park website. They have tons of 3D paper creations that you can print from your home computer for free! Each project comes with detailed directions to easily create some really cute stuff. One of my favorites was the template for the snowman ornaments. Check it out here. There is a blog that I follow called “All Things Paper,” written by Ann Martin, a quilling enthusiast who tends to find the most amazing paper creations. First of all, if you don’t know what quilling is, look it up. Better yet, check out Ann’s Blog because it is some pretty cool stuff. 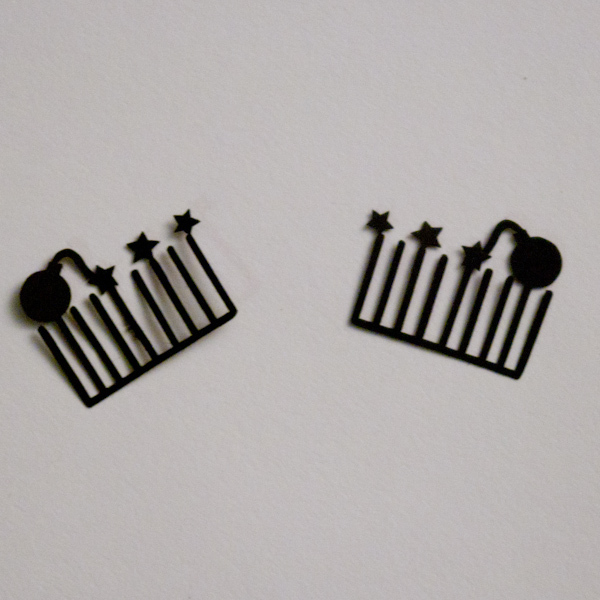 About a month ago, “All Things Paper” featured a post about some fun, decorative, fashion lashes made out of paper. 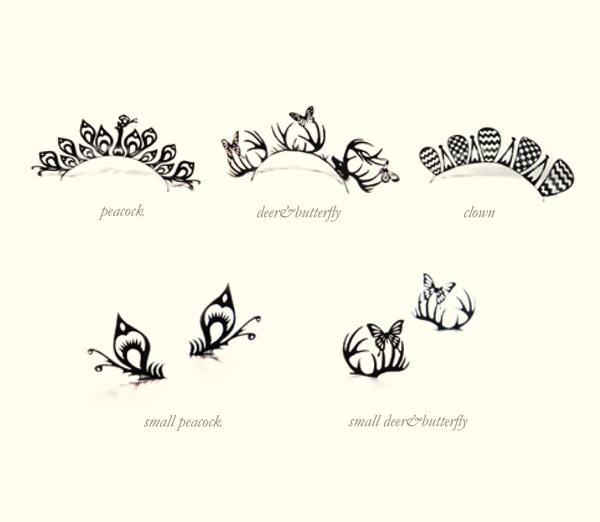 The lashes are made by a company called Paperself, and they feature a variety of designs including peacocks, butterflies, and clown lashes among others. When I first saw these lashes, my mind immediately went to how I could incorporate these into a Halloween costume. I actually have a friend who is planning to be a peacock for Halloween, and these lashes would be perfect for her! Without giving too much away, none of these lashes really fit the costume that I have in mind for myself. 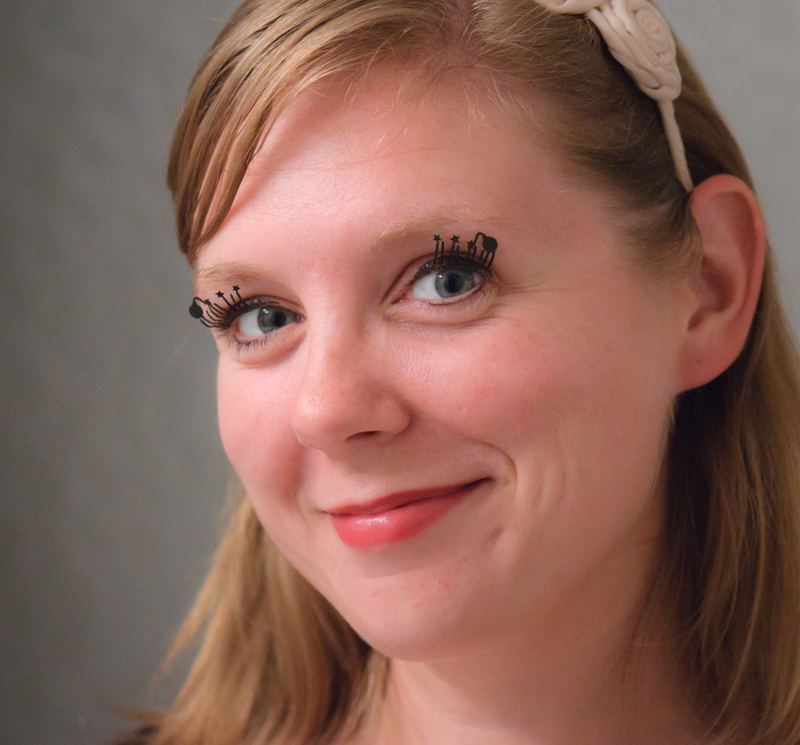 I am planning to go as a notorious criminal of sorts, so I immediately thought that lashes with some sort of bomb motif would be fun. I couldn’t find any lashes similar to what I was looking for, so I figured, why not make them myself? As mentioned in previous posts, I have a Silhouette SD, and it can do some pretty intricate cuts. I decided to try my hand at creating my own paper eyelashes. After a few attempts, I found that the Silhouette could not cut quite as finely as I would have liked. I ended up using individual lashes that were about 0.01 inches wide, and that were spaced at about 0.03 inches. It took about 5 tries before I had a design that did not get eaten up by the Silhouette blade, or destroyed when I tried to remove it from the carrying mat. The final product is shown to the right. I still was not sure if they would work out, so I decided I might as well try them on! I applied them above my natural lashes and used an eyelash curler just like you would with any other set of false lashes, and voila! Home-made false lashes made of paper! Chocolate Chip Cookies on the Campfire! Mark Your Calendars! Elation Greetings Will Soon Be Providing Wedding Invitation Services!